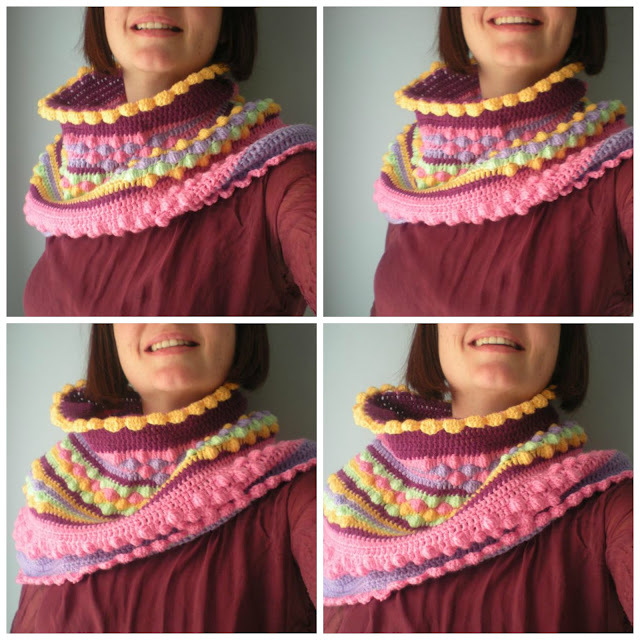 Now finally I can show you the scarf / cowl / stole (in the end is something mixed all this ...) I did for a interchange with Cristina of " no paris de cosir ". She fell in love with the scarf I made for celebrate 10,000 visits on my blog (you can see here). And she tell me that if I make a scarf for her. Well here it is! 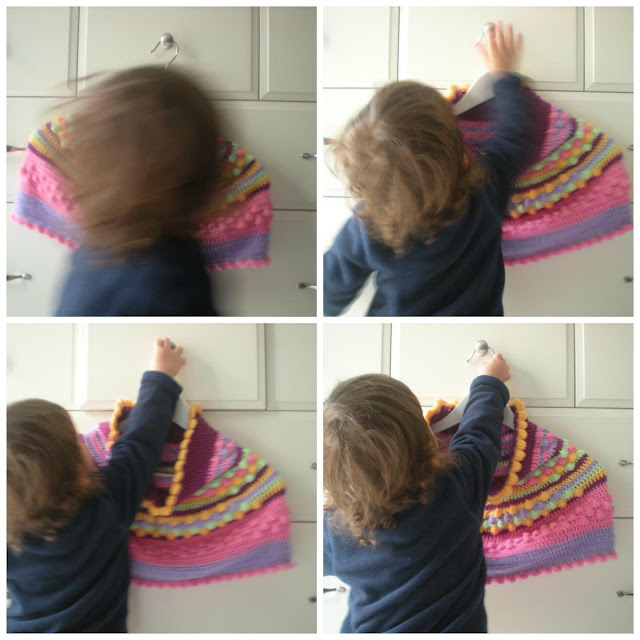 Today I want to presenting you the scarf for Cristina! And I've done lots of pictures because I have to say I love this crocheted scarf! Cristina, a little more and I take it for me! I love it! Maybe I should not say this, right...? But I want to say: I love, looove, looooooove it! 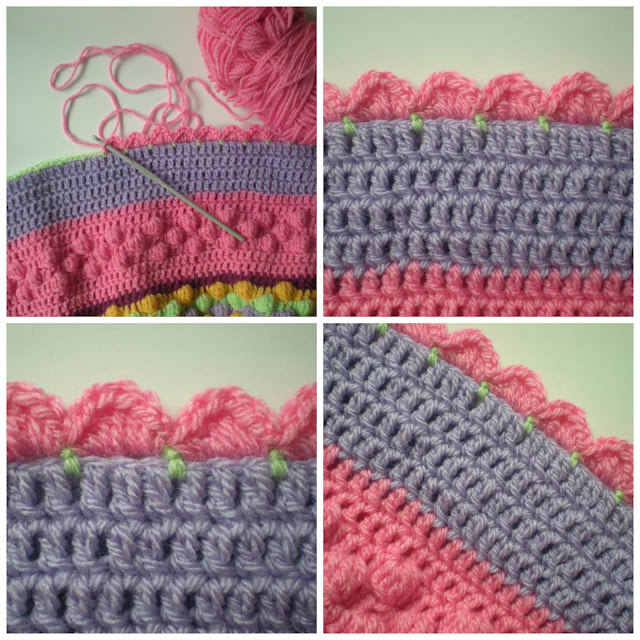 I worked with Stylkecraft wool and crochet hook 4mm. I've been doing round and round, first width , then narrower. Cristina said he was very fond of these small balls. Well, I make here much balls for her, very much! 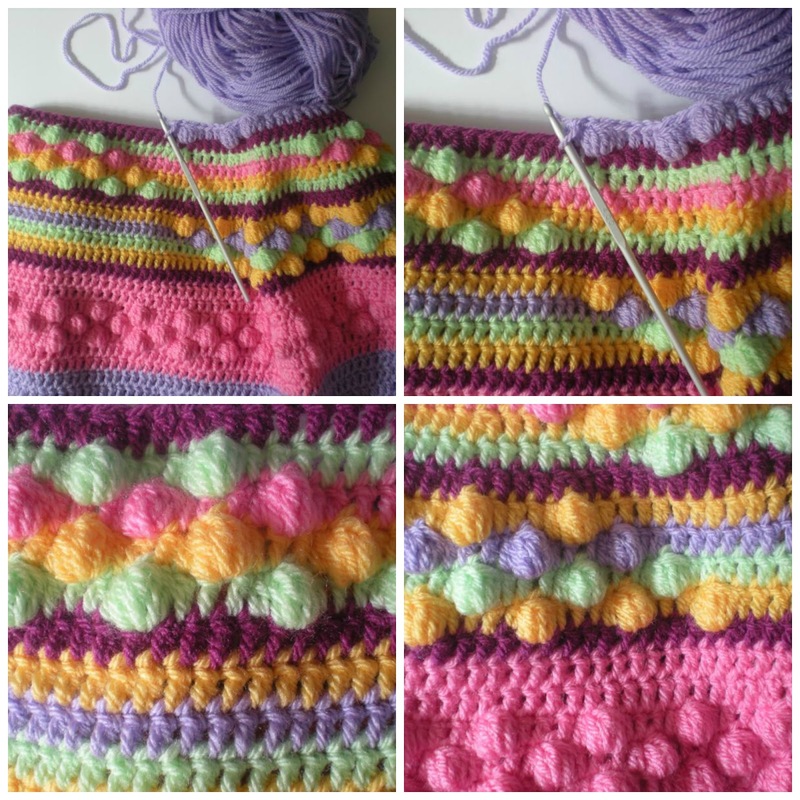 In the first I make a chain of one color and then the waves in crocheted in another color, what think you? I hope you do not tire with all photography that I made... 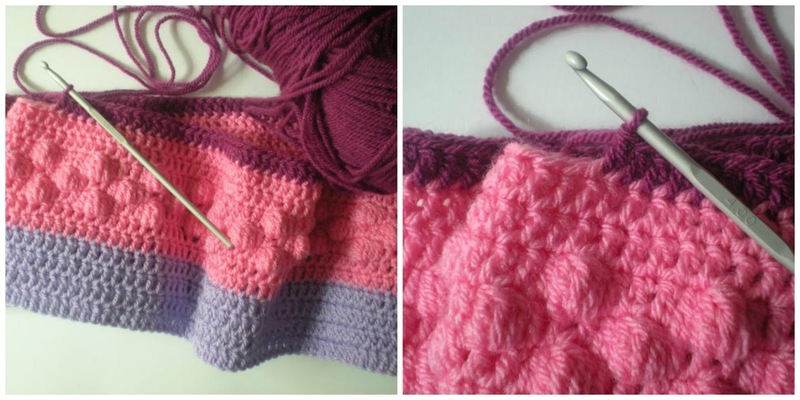 But I've been working three weeks with this crocheted scarf and I do not will see it anymore ... I wanted to make me lots of photos with the scarf! You will discover, Cristina, the scarf has a very nice tact. Maybe this year you can not show off it, but yes the next winter! The scarf is very warming. And I've done with many brightly colors because you glad the dark days of winter. I'm very proud of this work has been a pleasure to work and think that it was for Cristina. I waited a few more days before sending it by mail because I want this work to be the first with a label with the name of the blog ... my brand! my creation! I hope you liked, Cristina. As soon as I have sewn label I to send you home. I'm very illusion that a piece woven or sewn by me carry the name of the blog. For days I want to do a Giveaway and I have not organized anything ... next month will be the anniversary of the blog ... I promise that I will prepare some things! Thank you to stroll through the my world of wool! I am immensely grateful to you! T'ha quedat molt bé!!! la forma és molt original, i els colors m'encanten!!!! Quins colors més alegres!! M'encanta !! És so so cool!! Estarà ben contenta la Cris. Uaaauu! Xulíssima! I quina feinada! Gosh, that's just WOW! ♥ I'm totally thrilled. 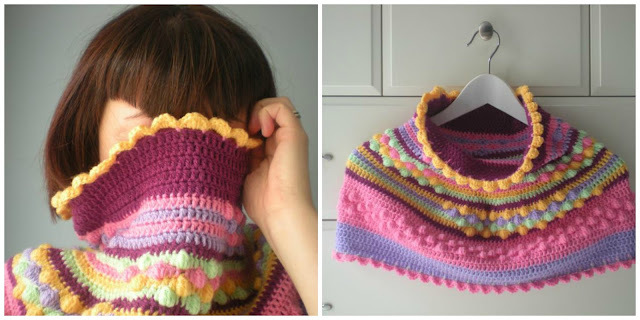 What a beauty this cowl is :-))). The colors, the stripes, the bobbles, the shells... so lovely! I could just snap it from the photo ;-). Really great job, Cristina!! Like Natas, I say a big WOW!!!!!!! Ai Cris per favoooooooooooor!!!!!! No pot ser més bonic!!!!!!!!!!!!! M'encantaaaaaaaaaaaaa, de debò.....MIL GRÀCIES per teixir aquesta meravella per mi, la lluïré super orgullosa!!!! I amb les boletes..... És perfecte guapa....GRÀCIES GRÀCIES GRÀCIES!!!!!!!!!!! Muaaaaaaaaks!!!! Uau! Preciós, els colors m'encanten! Hauria de deixar de fer tants ninotets i fer coses útils i boniques com això! És una preciositat, quins colors, quina combinació de punts!! Ets un crack del ganxet! Cristina, it is very beautiful and I understand why you want to keep it and have taken so many pictures. It is just gorgeous: colorful, fun pattern, unique in the Whole world there is no other like it and that's the best part of our work. You made it perfect and I know she will love it. Take many pictures and enjoy it while you have it with you. Label makes it even better-very good idea. I must get some labels made for my things. Thanks for sharing this most luxurious and pretty handicraft with us. Lucky girl, Cristina, for such a wonderful gift. I don't have a problem to write you an email using your address!!! Hello Cristina, Alessandra just explained what I meant :-). 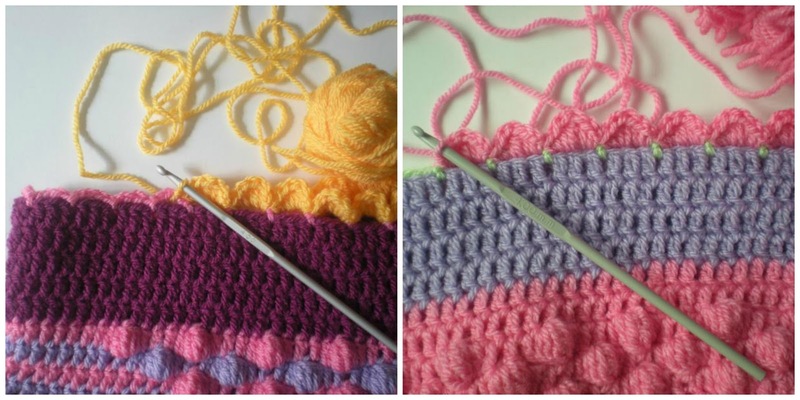 A few minutes ago I also wrote you on my blog (the crochet hooks post) and send you an e-mail to your given address as well. I hope everything's o.k. now :-)). Have a happy day!! wowww... super cute and very love the color! Oh WOW! I love this scarf! It is so pretty and the colors are great! this is a beauty-i love love love it! great work. Que maravilla cristina! es preciosa, cuantas cosas me he perdido, a veces nos falta tiempo para todo, me encanta como combinas los colores, y las fotos son muy simpaticas, me encantan!